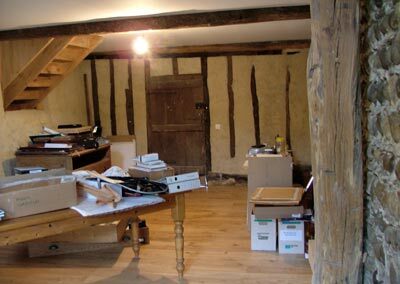 Since we last wrote there are four spaces in the house that have been pretty well finished. 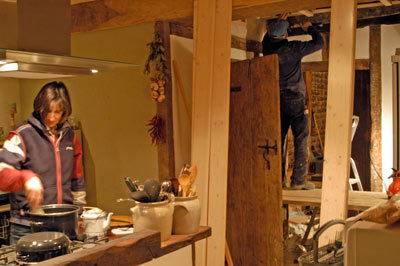 The kitchen finally had its ceiling closed off after the plumbing from the two bathrooms had been double checked. 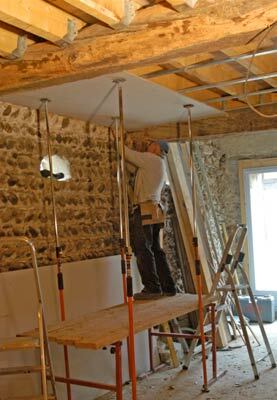 The boiler room also got a fireproof plaster ceiling and some good sound insulation. 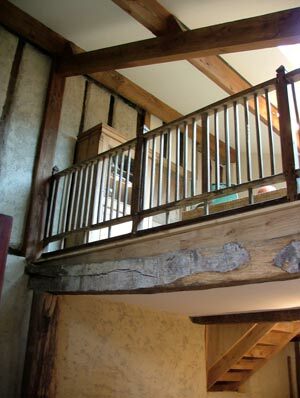 The mezzanine above Perry's studio was floored, varnished and the balustrade was placed. 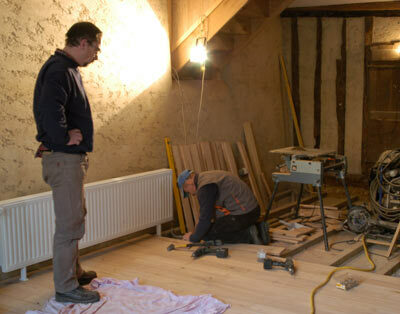 Finally, Perry's studio has a floor, ceiling and electrics and is ready for the furniture and equipment. The following images tell a more complete story. Who put bits of plaster in my soup!!! 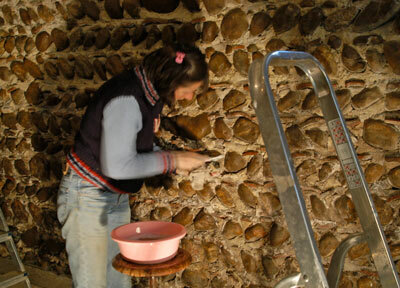 Caroline scrubbed the old stones of the chai with a toothbrush, one by one! wall of the guest bathroom. 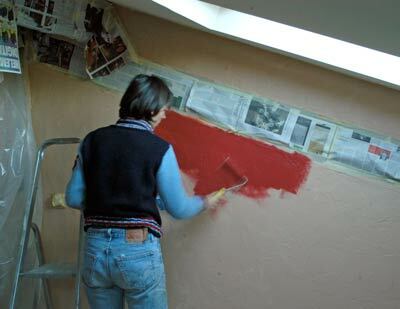 The end wall of the mezzonine took four visits to get the colour right. 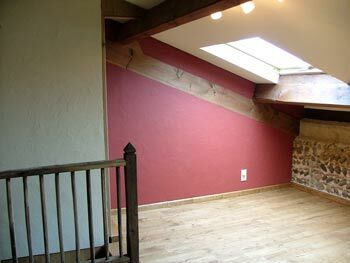 First a far too strong sienna, then a sandy umber, followed by a horrible peach and finally a deep terracotta to highlight the old roof tiles in the wall. Those little sample swatches are difficult to judge when you are in a different light. And finally the floor. One coat of light tint and three coats of varnish. (that's a ruif for you Dutchies) from the cow stables. Ernest came to measure up. 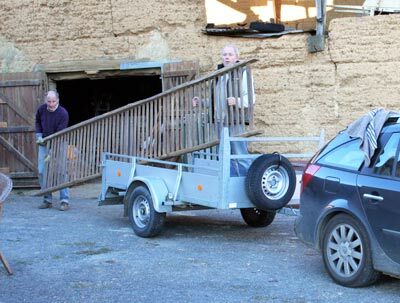 The old manger is over four metres long and made of oak. Very heavy and not very easy to maneouvre. Off we went with it to Ernest's workshop. 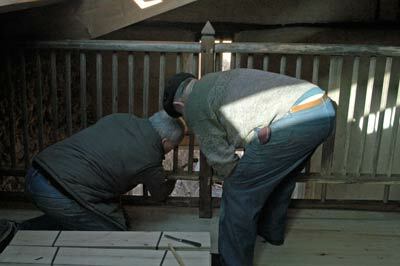 The carpenter's bum competition was won by Ernest, two cheeks to one. of the stairs. 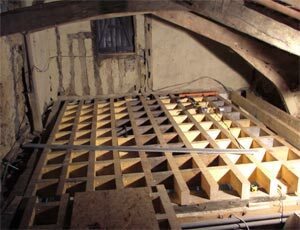 Now just to knock in the wooden plugs. Not a screw or nail in sight. 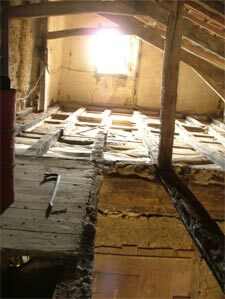 the plaster ceiling within three days. The old earth wall had crepis (render/stuck) until almost down to the floor. Jorge finished off the last thirty centimetres and fitted a plynth. 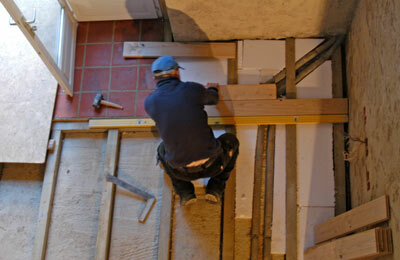 laid the batons and insulation, before starting with the parquet. Klaus turned up to fit the radiator as Jorge cut around the plumbing. to the Mairie. Noel Deffis made sure that all we had hired had been returned. So, a month ahead of schedule, we had the studio ready. Caroline's enormous wardrobe into the house. painting materials he has had stored away for years in the barn. It's like Christmas, opening all the old boxes. 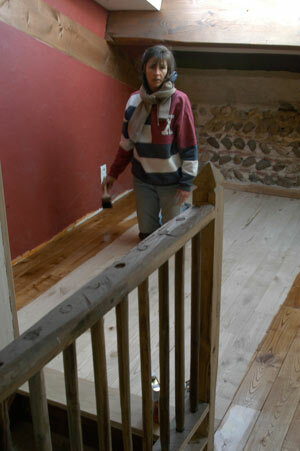 The mezzanine looks a little bare, but will soon add an extra dimension to the house. But remember what it looked like before?...here are a few flashbacks. 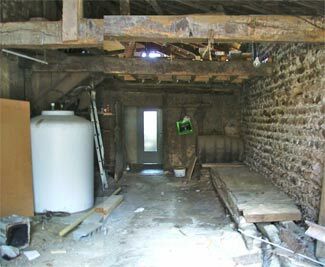 The rotten beams, dead rats and woodworm filled joists above the kitchen and chai. We too felt pretty rotten when we saw how much work had to be done. 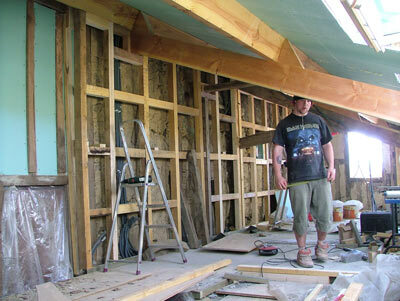 Removing the rotten wood, cleaning up the support walls and laying the new beams to support the bathrooms. 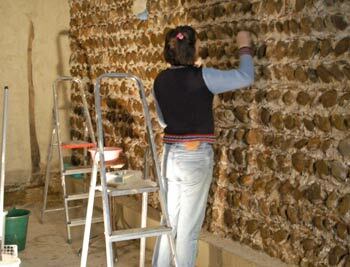 Creating the cavity walls. 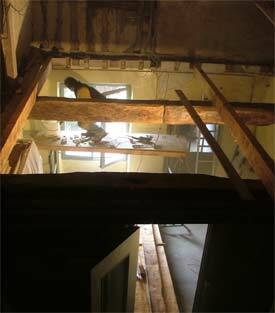 Shot taken from what is now the mezzanine towards the two bathrooms. 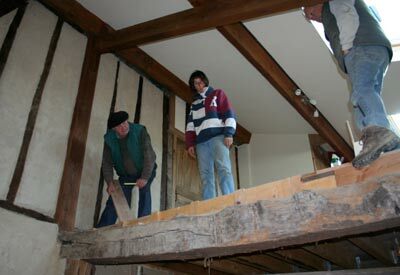 The steps down to the main stairway are to the left under a plank. Boy, that all seems a long time ago! Well, we plan on getting the cement removed from the outside of the house. 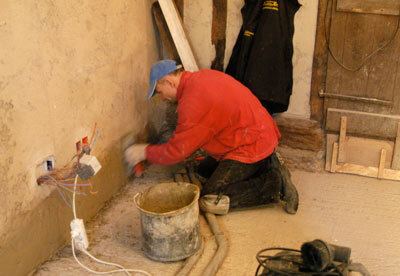 It keeps the moisture in, which when the walls are made of earth, is not a good idea. 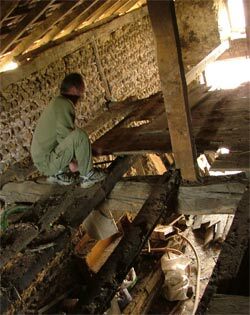 Secondly, the big barn needs a new roof. The storm in June tore some more tiles off. The rain caused a few large chunks of the earth wall to crumble too. 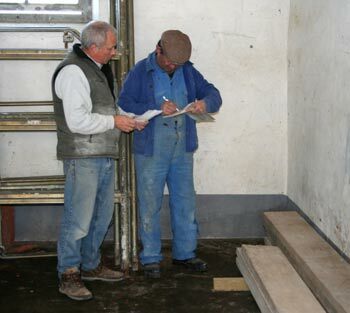 Alain, the roofer, came over with Michel, the mason. Together they will get cracking at the end of the summer. Another nice big dent in our finances. 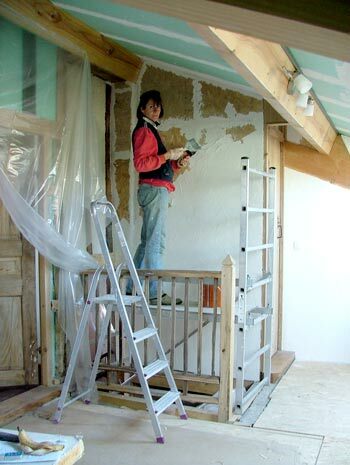 2009 will hopefully see us starting work on our bedroom. 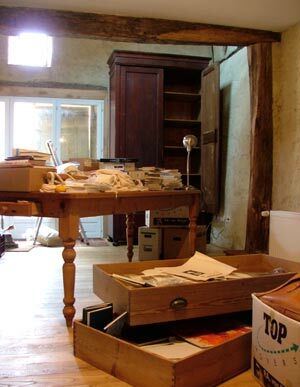 Then we can move over and leave our present bedroom for our guests. Let's get this year out of the way first though, eh?